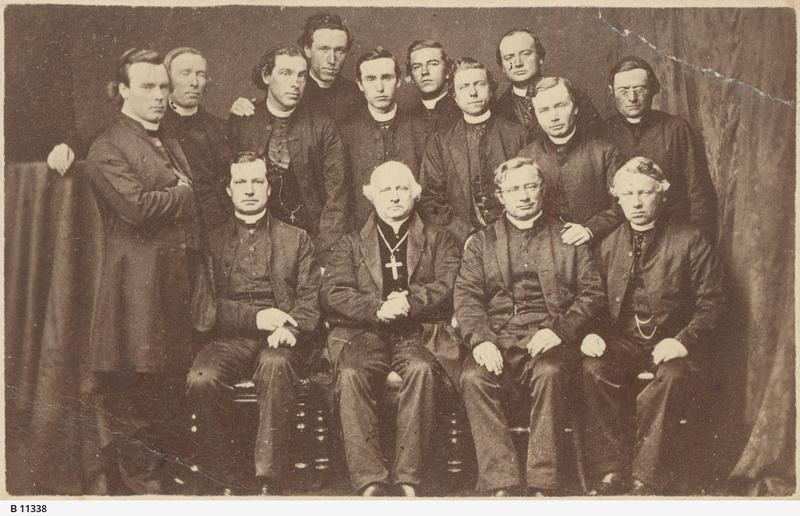 Group of Catholic Clergymen of Archdiocese of Adelaide. Left to right, standing: Rev. Christopher Augustine Reynolds (later Archbishop); Rev. Peter Hughes; Rev. Julian Edmund Tenison Woods; Rev. Michael O'Connor; Rev. Thomas Dowling; Rev. Theodore Boengaerto; Rev. Charles Van Der Heyden; Rev. Simon Carew; Rev. Frederick Byrne (later mons. ); Rev. Aloysius Kranewitter, S.J. Sitting: Very Rev. John Smyth (Vicar General); Rt. Rev. Bishop Laurence Bonaventure Sheil; Rev. Fr. Joseph Tappeiner, S.J. ; Ven. Archdeacon Patrick Thomas Russell. A researcher has provided the following information about Rev. Thomas Dowling: born in 1838 and raised on a small farm in a town called Cappanaclough, near Abbeyleix in the County Laois, Ireland, and died in Mount Barker, 1868 aged 30.